I write this with a deep sense of exasperation - anger, resentment, a sense of powerlessness. It is, I believe, in our nature - mine certainly - to beautify the space we inhabit. To try and bring nature and serenity into the realms we occupy, however fleetingly. A while ago, surrendering to that innate desire (and at some personal expense to myself) I bought five beautiful young golden Cyprus trees to plant in the pots at the entrance to Pascal's. The aim - simply to beautify, to please, to make happy both myself and others. Image my shock and anger this morning as I was confronted with senseless vandalism. Someone - or some few- had walked past and maliciously ripped all the trees from their pots and left them lying on the sidewalk, roots already dry and leaves wilting. Why destroy something of beauty - with no personal gain? We are all guilty, at some stage of our lives, of destruction, physical or emotional, but there is usually a motive, a selfish purpose - something we gain from it. I sit here now, writing this and wondering what could be the possible motive for an act such as this. Jealousy? Powerlessness? Perhaps growing up in abject poverty with little or no real hope of escape from it does foster resentment against those who are seemingly affluent or better off - and the frustration this engenders needs some sort of outlet. By acts of destruction such as the one above, this frustration has an outlet and at the same time, empowers the powerless. Although the act of destruction seems meaningless to me, it obviously feeds a need in the person perpetrating it. Our government, our civil society, our religious institutions our communities - and we as individuals - need to all work together to positively empower members of our society who so often fall through the cracks. A kid who is part of a soccer or cricket club, who takes pride in their achievements, is a lot less likely to follow the path of wanton destruction. It is our problem - whether we like it or not. Drinks and snacks will be served at both events. Grierson Van Gend - Don’t miss this magic folk duo! El Caracol opens it’s doors. Napier’s newest food haunt, promising authentic Spanish Tapas and Treats, opens up on Sarel Cilliers Street. Contact Deon or Ida on 0720121492 or 0764264241 for reservations. Celebrate Christmas Eve with a full 4 course dinner at Pascals of Napier. An informal, yet traditional 3 course buffet. Adults R145. Children R75. Live Music and dancing – Rock’n Roll is King with Vernon Barnard. Dinner will be served and there is no charge. Anybody willing to supply accommodation to His Holiness during his stay in Napier can also please contact the above number. Happy a wonderful Christmas together! Wish we could be with you! Sue Morley let the Natter know that her computer has been hacked. She received a call from someone at “Microsoft” in Calfornia, telling her that her computer had been flagged and compromised and the caller was then able to get details like bank accounts, etc from Sue. Sue has since had to change all her accounts numbers, telephone numbers, e-mails, etc. Be warned – this is a scam. Not many people in Napier know that the Napier Yacht Club was established about five years ago. The age-old ceremony in the form of the traditional opening cruise, with sail past and salute to a yet to be commodore, was duly performed by Okko with his OK dinghy and yours truly with “plastic soapdish” dinghy, on the local dam. Unfortunately, a stiffish breeze caused both our craft to capsize. The OK dinghy centreboard got swollen and jammed in the centreboard casing, my little boat did not like the hidden rocks, and so the cruise was abandoned. Somehow, the opening cruise also became the closing cruise and we never went back. The effort of launching and retrieving the craft was just too laborious. - Sailing within ten metres of an upended flapping whale tail within the Simonstown yacht anchorage. - Leaving a phosphorescent sparkly fairytale road 500metres long behind us on a very dark night. - Rounding Cape Point and looking up at its awesome towering majesty. - Coasting down huge swells while running with the wind. To those of you who would venture forth on the deep blue sea, you would have to at least learn the lingo, which, to the uninitiated, can be confusing at best, and at worst, unintelligible. You must know when to port your helm, go about, gybe, ease off, harden up, swing the compass, luff the main, weigh anchor, drop the hook. Every one knows that port gives way to starboard. Reaching, especially broad reaching, running and gullwinging, is usually more fun than beating. Of course you can stop or steady the boat, by heading into the wind and sheeting the jib to windward and backing the main. Alternatively one can feather the jib and harden up on the main. By performing the latter, there is a danger of going into irons, which could lead to broaching. Broaching in rough waters can be dodgy, and absolutely deadly if in sight of the yacht club. A spirit of light-hearted and unforgetting schadenfreude prevails at all yacht clubs, and one is not allowed to forget any sail fudging in full view of the bar. So those are just some of the terms for the act of sailing, never mind the terminology for the hull parts (pulpit, pushpit, gooseneck, rails, lazarette, boom vang, spreaders, etc.) and the standing and running rigging and the bits and pieces that inevitably encrust a boat. Abeam - A big plank. Antle - A small windstay attached to the port lug with a catscrew which can be adjusted by a righandle to bring the mainsail crashing down. Back & front - It would be sensible to call the back and front of the boat the back and front of the boat, so they don't. The front is actually the beginning of a new weather system. It would be sensible to call the end of an old weather system a back, so they don't. A back is actually a sail with its clew sheeted to windward, whatever that means. Bail - "For god's sake do you want us all to drown - don't just sit there like a stuffed dummy but get some of that water out of here!". This is called asking for bail. Backstay - Time allowed in port between races. Binnacle - Sort of mechanical device with which many boats get encrusted, making progress through the water difficult. Burgee - Small Australian cage bird. Boom - A loud noise to mark the start of the race; Traditionally the point at which you find yourself tacking the wrong way on the wrong side of the line. Cleat - A short, sharp agonising blow on the elbow from a metal protuberance. Gybe - To make fun of a crew member after he has, e.g. fallen overboard. Hove to - So is Hove. Jury rigging - Illegally fixing the result of a race. Knot - Unit of distance; the distance travelled during the time it takes to tie a knot. Leeward - Pronounced 'looard', this means the direction of the nearest lavatory. cause a nasty hole in the hull. Pilker - A small bluff attached to the lansail stick through which runs a stay-yard, which can be used to control the jibrun. Rope - Rope, of course, is never, never called rope. Ropes are called stays or guys or sheets or halyards or warps or lanyards or bridles or shrouds- call them anything you like, in fact, but don't call them ropes. Sheet - Obviously, this is word for a sail. So you wont be surprised to learn it means a rope. Spat - A friendly fight to decide who shall put up the spinnaker. Spinnaker guy - The fellow who loses the fight and puts up the spinnaker. 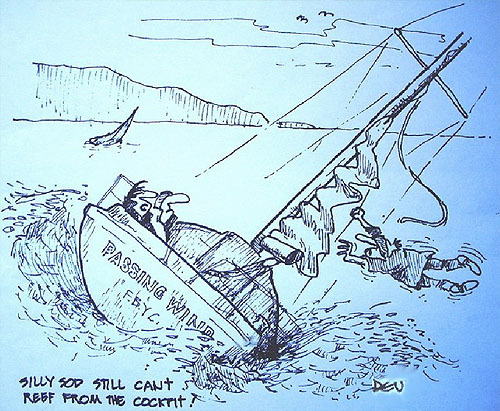 Spinnaker Boom - A short lived upsurge in the selling of spinnakers from 1969 to 1971 which fizzled out suddenly and left many spinnaker makers bankrupt. Stern - Descriptive of the captain's expression as he watches the crew try to put up the spinnaker. Tack - Lunch (also bight). Twine - The name by which Mark Twain is known in Australia. Whipping or lashing - a traditional naval punishment. It consists of making the crew spend hours on end tying up frayed ends of rope. Yawl - A hearty greeting (deep South of America). We thank you and we salute you. The Napier Natter wishes all the readership a joyful Christmas and may 2014 be a year surpassing all others in terms of peace and happiness.